History: A simple shaman's staff, it was gifted to him by his mother the day he was sent away from home. It once belonged to his father, who used it in various shaman ceremonies. It has almost no combat value, and is merely a sentimental item. However, he does have a tendency to use it almost like a pointer; using it to guide growing plants and vines out of habit more then anyway. It has no effect other than to extend his reach in this instance. 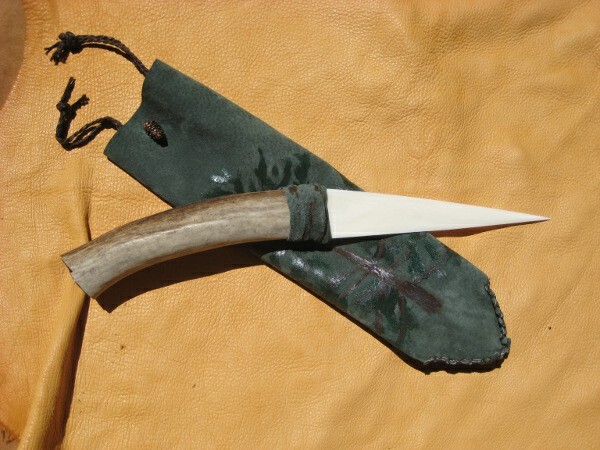 A simple knife made of antler and bone used by Davin as a form of protection and as a tool to aide in his tending of plants and larger trees. Normally kept safely tucked away in a leather sheath. The blade of the knife is roughly 6in (15.24cm) long, with handle of roughly the same length. Said handle is wrapped in tanned leather that allows for a solid, firm grip. This knife is strong enough to cut unprotected flesh, simple, low durability clothing (common cotton or thin wool) and can be used to saw through wood. Anything more durable than wood is unaffected by this knife, and it can easily be broken by stone or metal. History: Davin fashioned this knife himself using one of his shed antlers and the hide of an fresh animal carcass that he came across while walking through the forest. He used stones to grind and rub part of the antler down into a durable, fairly sharp, knife edge before wrapping the remaining part in the freshly made leather.